After the success of my lemon drizzle, I decided to attempt a traditional Victoria sponge and, after all, what could be so difficult about such an easy cake?! Ha! I thought wrong! First of all, the recipe called for a whipped cream and jam filling. With hindsight, this seems obvious and completely justifiable having tasted the cake but I immediately presumed I would be using a buttercream filling. So, after sending my boyfriend out for cream, I attempted the sponge. After following the instructions and finding my mixer could only do half the work, I sighed, folding in the flour with a metal spoon? Isn't that what my mixer was for!? Never the less, I finished the mixture off with the largest wooden spoon I could find and began to pour my cake into the tins. This was where I stumbled across the next problem as I tapped the tins against the work top to even layer the mixture and consequently knocked all form of air out of my potentially wonderful cake. This didn't make any difference to be honest but as the cake was a gift, I was petrified it had failed and I would probably never know! Luckily my Grandfather, who the gift was for, halved the cake and I came home with some (score!!) to taste test. In terms of presentation, I was mightily impressed (see above photo!) 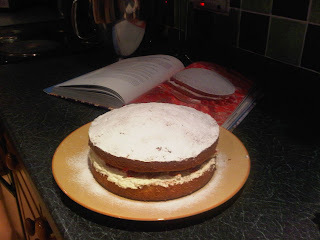 as I delicately sprinkled icing sugar over the top as I've seen Nigella do so many times. For reasons beyond me though, I decided to go against the recipes suggestion of layering cake, cream, jam then cake once more and instead I put jam on one side, cream on the other and squished them together. This just made the jam less visible but made no difference to the taste, I should follow the rules next time!! However, as I sit here and moan about my somewhat lack of common sense in the cake department, I eat my wonderful, airy, deliciously creamy and jammy Victoria sponge and I know I've succeeded. The cat and my dad agree too. 4 rounded tablespoons of good jam- raspberry, blackberry, strawberry etc.